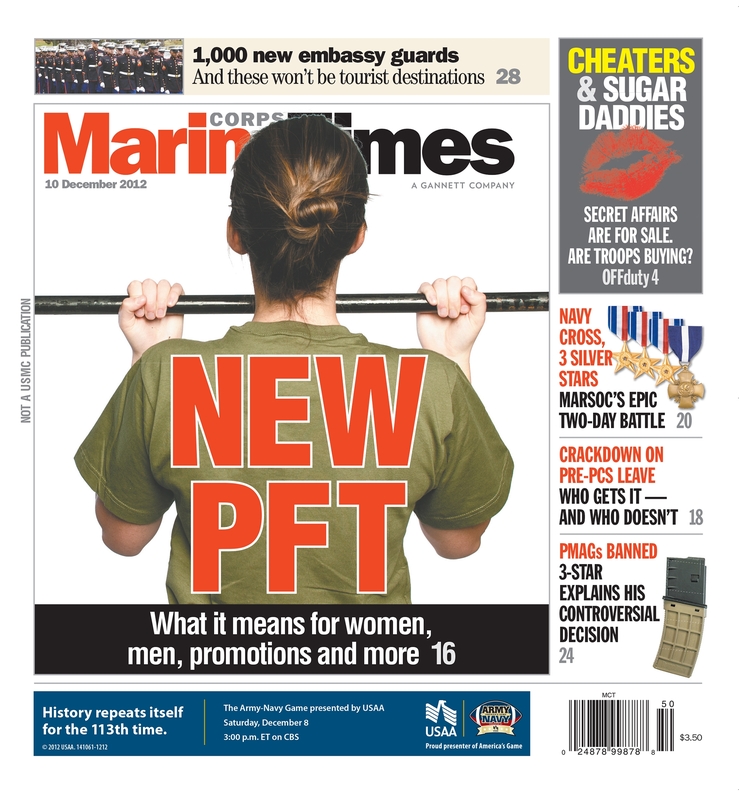 This week’s Marine Corps Times takes a look at the new physical fitness requirements for female Marines and the impact the change is likely to have on the entire force, not just women. In a forcewide message last week, Marine Commandant Gen. Jim Amos announced that women will be required to complete three pullups to pass the test and eight to achieve a perfect PFT score starting in 2014. The change is likely to impact promotion fairness and unit training for men and women starting in 2013. The flexed-arm hang will remain as part of the Corps’ initial strength test for female enlisted recruits and as part of the initial PFT required for female officer candidates. But in 2014, “passing the PFT with pullups instead of the [flexed-arm hang] will be a graduation requirement for recruits and officer candidates,” Amos wrote. The announcement comes at an interesting time. During the past year, dozens of billets, historically reserved for men, have been opened to female Marines as part of an ongoing effort to break down long-standing gender barriers. In September, two women were allowed to participate in the grueling Infantry Officers Course for the first time. Both women ultimately washed out but the experiment is part of an ongoing process to determine how women might perform under the physical and psychological stressors of the infantry. The Marine Corps was expected to make its first round of recommendations to the Department of Defense in November. I sat down with Lt. Gen. Richard Mills, deputy commandant for combat development and integration, to discuss why the Corps made the change and whether men can expect to see changes to the PFT as well. I also asked him why the Corps made a decision to ban Polymer rifle magazines, something our readers have been weighing in on via social media since last week’s announcement. As an avid runner and self-proclaimed gym rat, this story was a fun one to write. And if the hairstyle on the cover photo looks out of regulation, that’s because it is. I posed for the cover photo and realized it’s actually a lot harder to master the art of the sock bun than I thought. With a little more time, I probably could have used some hairstyling help from this step-by-step guide to the sock bun. Pick up a copy on newsstands now or subscribe online here.